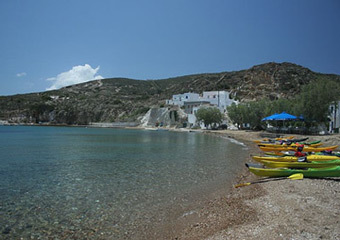 Aliki and Bonatsa are two of the most known and large beaches of the island. 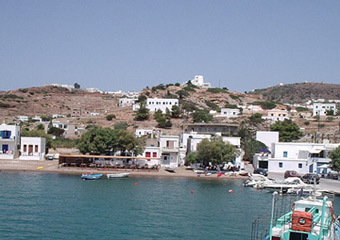 You can find them in less than 2km southwest of Chorio. They are very close to Psathi where you can also take a swim and Kalamitsi' s beautiful beach is also nearby. Following Kalamitsi are Pigados, Livadaki and Klima all in close distance. A bit higher to the east is Agios Georgios beach in Prasa with white sand and green waters. For those of you who are adventurous visit Skiadi, the big sculpture created by nature which looks like a mushroom and is on the central part of Kimolos. Or the small archaeological spot where the sunk town was once situated. They say that if you swim quite far from the beach you can see its ruins at the bottom of the sea. 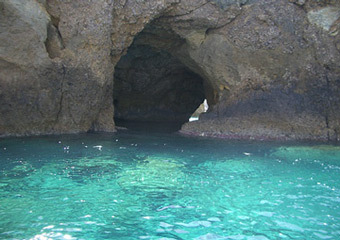 And some good choices would be the caves of Gerakia, Kakos Potamos and Vromolimni. For those who have boats Tsi Dekas, Mavrospilia a long deserted beach, Lakkos, Therma and Agioklima to the west and northwest are a perfect idea. According to many these are the best beaches of the island. 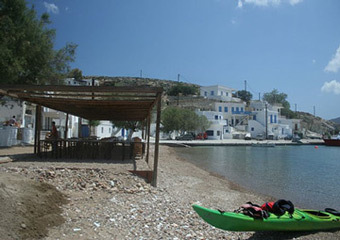 With your own boat or a caique you must also go for swimming to the island opposite to Psathi Polyaigo. And finally Soufi, a non-organized beach with turquoise waters to the north along with Pano Mersini and Kato Mersini are beaches that you will definitely reminisce during the winter.